Because if he told them, he’d have to kill them. Wait. He did. Several people have questions for John Brennan, President Obama’s chief counterterrorism adviser and his nominee for CIA director, whose confirmation hearing is tomorrow. Unfortunately, none of them are senators who’ll be asking questions. One of the questioners is Salem Ahmed bin Ali Jaber, a father of seven children and a Yemeni cleric who apparently opposed Al Qaeda and its allies in Yemen. While he was arguing, alongside his cousin, with several Al Qaeda members who were angry with him, he was blown to pieces in a drone strike carried out by the United States. Oh, wait, he can’t ask Brennan anything. He’s dead. Oops. Another question for Brennan comes from Saleem Hussein Jamal. Jamal happened to give a lift to some people who’d offered to pay him for a ride. During the trip, because the five riders were apparently Al Qaeda members, the car was blown to smithereens, and rescuers couldn’t identify anyone except by scraps. “We found eyes, but there were no faces left,” said one. Oh, Jamal can’t ask Brennan his question. He’s dead, too. Oops. Dozens of questions come from Yemenis who experienced a US military drone strike in December 2009, the first in Yemen during the Obama administration. Unfortunately, because dozens of civilians died in that strike, which carried cluster munitions, they’re not going to able to ask Brennan anything, either. They’re all dead, too. Oops. Another question comes from Anwar al-Awlaki, by all accounts a scurrilous individual, an Al Qaeda fanatic who happened to be an American citizen. He’d like to know exactly what legal justification there was for a drone strike that killed him, and another one that later killed his son, also an American. The White House may have good reasons to do so, but so far Obama hasn’t been willing to disclose them. According to various reports, in The New York Times, NBC and elsewhere, internally the administration said that it carries out strikes such as the one against Awlaki when it detects an “imminent” threat and concludes that there is no alternative to a strike, i.e., that the target can’t be captured. But because the administration won’t release its opinions, Awlaki can’t find out if any of that makes sense. Oh, wait, he can’t ask Brennan his question, either. He’s dead, as well. Oops. These few cases are drawn from a Times piece today, and a parallel one, that dissects some of what’s known about drone strikes. Hundreds of other innocents, especially from Pakistan, would be lining up for the Brennan hearing tomorrow, too, but, yes, they’re all dead as well. Thanks to NBC, you can read the whole “white paper” that the Obama administration gave to some members of Congress (but refused to release to the public) explaining its rationale for the strikes. By many accounts, Brennan has quietly sought to limit drone strikes, even as others inside the administration, with both the CIA and the military’s Special Operations units, press ahead. If so, well, it’s hard to imagine how successful he’s been. 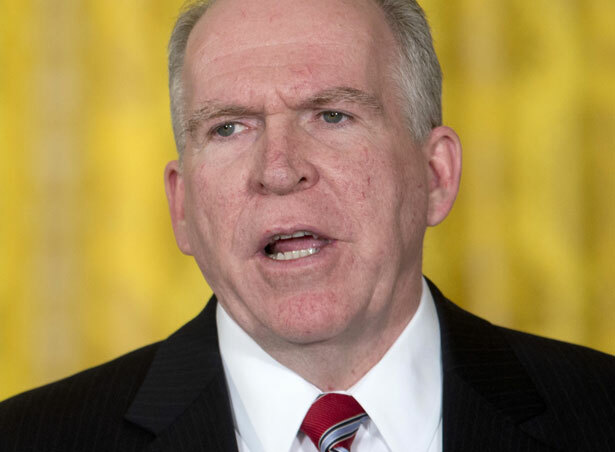 Brennan, a long-time CIA operations officer and former station chief in Saudi Arabia, is a lethal foe of Al Qaeda. He’s no softie. But if he’s pressed hard by the senators tomorrow, it’s possible it might convince him to move a lot harder and faster to wind down the Global War on Terror’s worst remaining component. The white paper scandal has the media up in arms today, Greg Mitchell notes.